Loaded with finely ground pumice, this gritty bar will scour your hands clean. 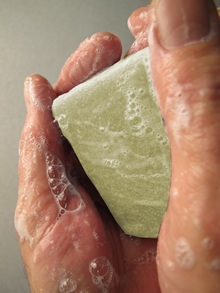 After a messy job or a grimy project, it’s the best soap to grab. And here’s the Herbaria bonus: your skin will feel smooth, soft, even moisturized. Soothing shea butter is the superfatting emollient in the bar. The fresh, natural scent comes from essential oils of rosemary and lemon. Very pleasurable! What’s the hobby or labor that leaves your hands needing extra cleaning? Yard work, painting, auto maintenance—we guarantee you’ll find this bar your good friend. You'll feel the pumice in the luxurious lather.